Xiaomi is in the news these days due to its flagship of 2017, the Mi6. Interestingly, we still have no real image of the device being leaked and every Xiaomi Mi6 image that you have seen previously is just a concept. Today, we have the screenshot of the ‘About Phone’ section of a device leaked that could be the Mi6. Now, before talking about the Xiaomi Mi6 specs, we want to clear that leaks should never be taken into consideration as 100% accurate because most of the times, they have turned out false, especially when they’re from untrusted sources. Same is the case with this one as Weibo is the source of this new leak and we all know that not every leak is real when it is via Weibo. 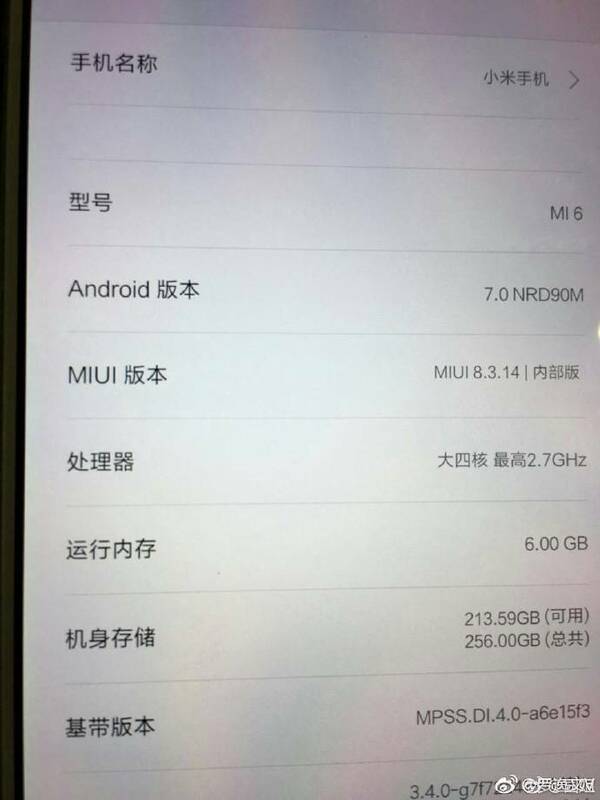 ARE THESE XIAOMI MI6 SPECS? Looking at the screenshot above, we can see ‘Mi6’ being mentioned as the name of the phone along with some other specs. The phone runs on Android Nougat with company’s MiUI 8.3.14. There is 6GB of RAM along with massive 256GB of internal storage out of which, there is 213.59GB of available space. Talking about the processor, the screenshot reveals 2.7GHz processor having four core. Now, this is surely not the Snapdragon 835 as that is an octa-core processor, and also, the Snapdragon 821 has the clock speed of 2.4GHz. So, there are chances that the Xiaomi Mi6 packs an overclocked processor or maybe company’s chip! Well, since this leaks has some of the things that are confusing, we surely won’t say it is 100% correct. So, you better take it with a pinch of salt. That will be better Stay Tuned for more updates.